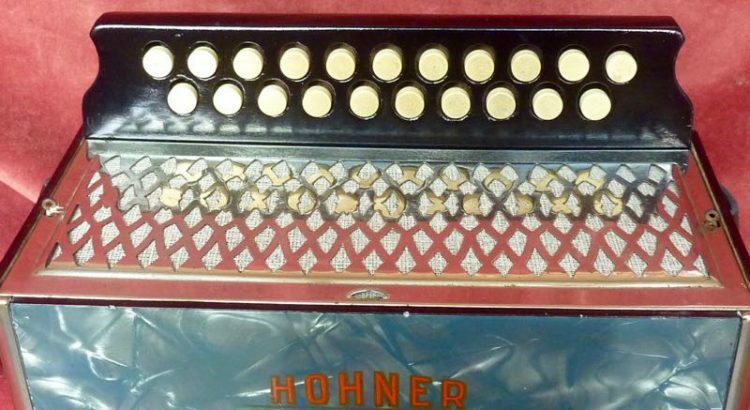 I recently acquired this very rough looking two row Hohner. It looks so horrible I thought it would be fun to document the process of returning it to full playing condition. Here are some pictures showing the condition as found. one of the glue blocks is missing that should locate the treble blocks. keyboard top is broken, has been repaired, and the repair is broken. Now I start work by stripping down and cleaning everything to assess what work is needed. I will replace that tan leather bass strap. It is very unpleasant looking and is as stiff as cardboard. I’ll also replace the damaged keyboard. There is a broken spring on the treble mechanism. Once the thick accumulation of dirt is removed it all looks sound. No sign of dampness ever having affected the woodwork or bellows, and no sign of woodworm. Cleaning the pallets and removing old leather shows the wood there is also sound. The celluloid looked very dull and I though it might be faded from exposure to sunlight. On closer inspection I’m pleased to see it is just very dirty. With some mildly abrasive polish designed for use on plastics it cleans up beautifully. One source of mechanical noise is from the hard plastic bass buttons making contact with the holes they travel in. My solution is to ream out the holes to give space for a felt bush lining the holes. I also dispense with the felt washer behind the button. I leave the bush slightly proud of the surface so that the flange on the button is stopped by the raise felt before it can touch the hard surface below. The material I use is woven felt about 1.2mm thick. I cut it on the bias to prevent fraying and make a rectangle long enough to go once round the inside of the reamed hole without gap or overlap. The felt is glued in with pva and then pressed firmly into place with a tapered rod. The box is now back together again. Reeds fitted with new valves, re-waxed and tuned. I replaced the keyboard with a good one of similar vintage, and replaced the rusty grill with a spare one of the same pattern with its nickel plating still in good condition. The finished box is now for sale.